Although summer feels half over especially since we are already seeing back to school sales and the shelves are stocked, there is still plenty of hot sweltering weather to endure. The air where I live is so dry so I'm always battling dry lips and no matter what I use on them, it doesn't help long term. I knew I had some Carmex but due to my recent move, I wasn't able to find them until a few weeks ago and I finally found relief. Today, I received six Carmex sticks and a nice beach tote. The new flavor, pomegranate, is nice! It doesn't have an overwhelming scent, doesn't go on greasy, sticky or thick and has left my lips smooth and moist. You may not know but Carmex sticks have an SPF of 15 which is essential in good lip health in my opinion. Years ago as a kid, I suffered severe burns on my lips so I understand the importance of protecting your lips from the sun. My girls and I are always using lip balms but I can honestly say that Carmex is the one that really works and heals tough to treat damage. When we head out to the desert, I always grab a stick of Carmex to throw in the bag and apply it to the girls lips ahead of time. It works! One winner will receive the same prize pack as I did. 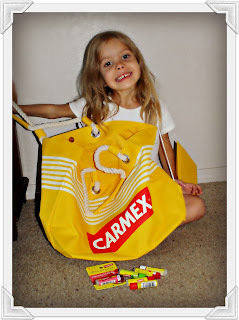 The beach tote and six sticks of Carmex to include the new pomegranate flavor. Giveaway ends 8/7 at midnight (EST) - Winner must reside in the US and be over 18. *Disclamier: I received this prize pack, the information and a prize pack to give away as part of my participation with the Carmex Blog Squad Team. The opinions expressed in this review are of my own. This would be great...I live at the beach! Thank you so much for the giveaway. I love carmex!! Going to share now. Thanks for sharing your review of Carmex with your readers. Glad to hear you like the new pomegranate flavor!